An alternate term for renewable energy. Energy generated from sources which do not produce pollutants (e.g., solar, wind, and wave energies). Energy generated from sources that produce low amounts of pollution. Energy that is produced and used in ways that produce relatively less environmental impacts. To these definitions we ought to add to further green dimensions, energy return on energy invested, and green land and water use principles. Thus the green potential of LFTR technology can be illustrated by comparing its "greenness" to the the "greenness" of solar electrical generation systems. Surprisingly the greenness of solar power cannot be taken for granite. The Energy Return on Energy Invested (EROEI) of solar cells is at best about 10 over their life time, and when you add the energy consumed in the manufacture of materials used in large scale solar cell arrays and during the construction of those arrays, the EROEI of PV generated energy becomes even lower. Indeed it has been argued that the EROEI of PV technology may be as low as 1 to 1. There is some debate whether PV technology produces more energy than it consumes. It is quite clear that at present PV technology is not economically viable and would not be used for electrical production were in not for a system of generous state subsidies there would be PV would not be in play at all as an electrical producing technology. If we add to the discussion about the question of green land use practices, the greenness of widespread use of PV electrical generation technologies clearly can be questioned. In the case of concentrated solar power (CSP), the potential for a positive return on energy invested is clearer. Although it cannot be said that there is a great deal of evidence, the EROEI of concentrated solar is reported to be about 10. Thus CSP is green by EROEI standards. But what about land use? Austra calculates that by using its technology a 92 by 92 mile square or 8464 square miles or 5.4 million acres would be sufficient to supply the entire United States with electricity at its current rate of consumption. David Rutledge, using real world data from Navada Solar One project land use asserts that it would take 11,600 square miles to supply current US electrical requirements. Bernadette Del Chiaro, Sarah Payne and Tony Dutzik claim about 10,000 square miles. We may not have an entire picture of the land use impact of solar installations. In addition to the installations themselves, land would be occupied by electrical gathering systems, electrical substations, and high voltage electrical lines. "We support solar power, but it is an industrial activity and putting it next to a wilderness area just is not a good idea". There you have the Green dilemma. a coal fired plant uses 110 to 300 gallons per megawatt hour; a nuclear plant uses between 500 and 1100 gallons/MWh; and a solar parabolic trough plant uses 760 -920 gallons/MWh. Efforts to increase water efficiency in solar energy operations involve modifying the conventional cooling tower. For example, dry desert air could be used instead of water to cool the operation. This, however, would greatly increase building costs because enormous cooling towers would need to be constructed. Also relying on air to cool would not cool the water circulating through the plant to a low enough temperature for peak performance, decreasing the efficiency of the plant. The Southwest has already has a significant water shortage, and climate projections are for the Southwest to become even dryer during the coming years. The only possible source of enough water for desert based solar thermal power facilities would be to withdrawal water from agricultural use and to transfer it to power production. This would in turn raise food prices in the southwest, and thus would paradoxically constitute a subsidy paid by poor food consumers who would pay higher food prices, to solar electrical producers who would profit from from nation wide electrical sales. Social justice is presumably a Green goals. 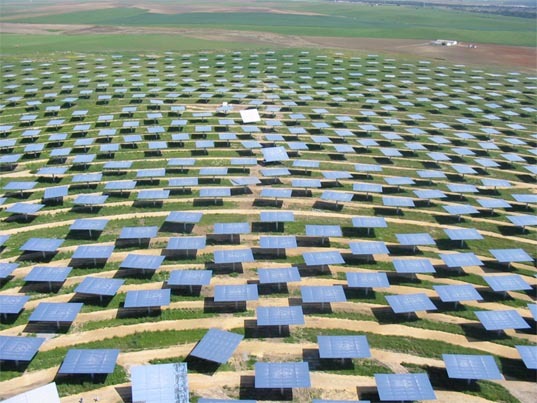 Within the Southwest, concentrated solar power is not environment friendly. It does not conform to green land and water use principles, and CSP water use requirements would indirectly make the life of the poor in the Southwest worst rather than better. Moving concentrated solar electrical production out of the Southwest is not an option, because solar electrical generation is highly dependent on cloudless skies. There is ample reason then to view there hither to unquestioned "greenness" of concentrated solar generated electricity as open to question. to no nuclear waste, thus greatly diminishing energy inputs into waste control. Material outputs from nuclear daughter products would be an energy savings, that would be unique to LFTR technology. It is clear then that the LFTR EROEI would from somewhere in the three figures at its lowest on up. From the EROEI stand point, the LFTR would be the ultimate in energy efficiency. not only their own nuclear waste, but also the nuclear waste of conventional reactors through the use of LFTRs. Thus the LFTR hasthe potential to be a 100% pollution free technology. The LFTR has the potential to be very parsimonious in its land use. First I have proposed the recycling of existing coal power plant sites. It should also be noted that much of the landused by nuclear power facilities is actually used as a land buffer for the mitigation of accidental release of radioactive products. Thus up to 95% of the land occupied by a LFTR facility may actually be set aside for conservation purposes. Compared to CSP facilities, LFTRs would have a very modest land use footprint. Underground placement of the reactor would further restrict visual intrusions, as well as add to reactor safety defenses. The LFTR would typically runs at a far higher temperature than conventional reactors. This higher temperature could be used to improve energy efficiency in electrical output. Thus a smaller percentage of the heat produced by LFTR would need to be dissipated by water cooling, In addition most potential LFTR sites are located in areas which do not experience chronic water shortages. Water conservation measure could be applied if needed, and water conservation facilities would already exist at some coal fired plant sites. If needed LFTRs could be air cooled. In the Southwest, LFTRs could be located near the sea coast, an option not available for CSP.. The Liquid Fluoride Thorium Reactor is by definitions green. The LFTR is green by the principles of green engineering. The LFTR conforms to the goal of green chemistry by not producing polluting waste. There is little doubt that the LFTR is greener than CSP in terms of energy efficiency, land use and water conservation, and could potentially be as pollution free as well. The LFTR thus is by conventional definitions of green, greener than all forms of solar power.